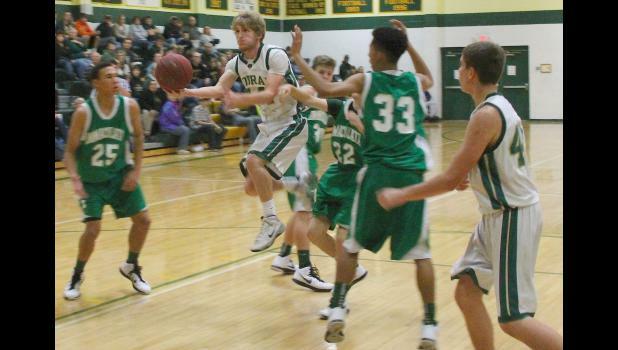 Early on in the Cobras’ opening game of the basketball season against Immaculata on Friday, it seemed like the Jackson Heights boys could do no wrong on offense. Jackson Heights hardly missed any shots on the offensive end and built up a large halftime lead on the way to a 50-27 victory over the Raiders to start the season. One player in particular seemingly couldn’t (and didn’t) miss in the first half as Zane Richter was on fire and torched the Raiders with three three-pointers in the opening quarter alone on the way to a game-high 25 points. All of those threes came as part of a 14-0 first quarter run that helped the Cobras open up the game after holding a slim one-point lead early. It was 19-7 in favor of Jackson Heights heading into the second quarter. From the opening tip, it was clear the Cobras were dictating the pace of the game. Brown noted before the season they would be an uptempo team and Jackson Heights delivered on the coach’s promise in the opening game. Though playing that fast comes with some downsides, the Cobras made it work in their favor for the most part. The strategy worked as the Raiders’ 6’ 6” forward, Conner Goetz was almost a non-factor in the game as Immaculata could not utilize his size advantage through most of the contest. While the Raiders tried to adjust and slow the Cobras down in the second quarter, it was a futile effort as Jackson Heights just adapted with its opponent. After Richter opened the quarter with a steal and a basket, Goetz tried to draw a charge on a possession shortly after that, but the Cobra instead pulled up for a short jumper that illustrated one of the keys to the team’s success on Friday. “I’d say nine out of 10 of our shots in the first half were good shots, good to great shots even. We were making the extra pass, we were finding Zane,” Brown said. In addition, Brown said he challenged his team to up its defense after a timeout with five minutes left in the second quarter. While the Raiders had been hanging around, the Cobras really snuffed out any attempt at a rally following the challenge and went on an 11-0 run before the Raiders got one final basket just before the end of the first half. “That’s what really gets me excited. Shots are going to go in or they’re not going to go in. Who knows? You play solid defense every second of a quarter, that’s tough to deal with,” Brown said. As hot as the Cobras started the game, there was sure to be some letdown in the second half. While there was, holding a 30-11 lead to start the third quarter put the Cobras in good position to close out the game. While the offense cooled off early, with Richter missing his first shot of the game in the third quarter, the Cobras still did a good job adjusting and Brown pointed to Richter as an example of that. “He’s shooting the three and he’s doing all these things and I think you saw him in the second half defer a little bit. I’d like to see him have a little killer instinct and really just go after it, but I thought he did a great job of playing a team game in the second half,” Brown said. Wyatt Olberding also poured in 11 points for the Cobras on Friday, while Lane Slocum picked up six points and six rebounds in the post. While the team stalled a little bit in the second half, they still had their moments, like a block by Braden Dohl fueling the team late in the third quarter. Brown noted the energy the Cobras played with in the first half might have caught up with them a little in the second half. “They played so hard in the first half that we got a little tired and we were playing in foul trouble and it just got a little sloppy. They still made plays, just not quite as many,” Brown said. Cooling off didn’t hurt the Cobras in the end, though, as they cruised to the victory over the Raiders and will now get ready for a tough early test against a strong Maur Hill team. While Jackson Heights wasn’t perfect, Brown said the team played well in its debut and can get better. With a week off before their next game, that’s what the Cobras will try to do preparing for a tough road contest in Atchison next Friday with games starting at 4:30 p.m.
JHHS: Richter 9 (4) 3-3 25, Olberding 3 (2) 3-4 11, Slocum 3 0-2 6, Strube 1 2-2 4, Jacobsen 1 2-3 4, Keehn 0 0-1 0. Totals- 17 (6) 10-15 50. Immac. : Goetz 5 (1) 0-2 11, Varney 2 (1) 0-0 5, Thibault 2 0-1 4, Hibib 1 (1) 0-0 3, Hernandez 0 2-2 2, Keys 0 2-2 2. Totals- 10 (3) 4-7 27. Rebounding: JH- 23 (Richter 7, Slocum 6, Jacobsen 3); Immac.- 18 (Downing 6). Assists: JH- 7 (Strube 3, Jacobsen 2); Immac.- 4 (Torres 3). Turnovers: JH- 17; Immac.- 26.